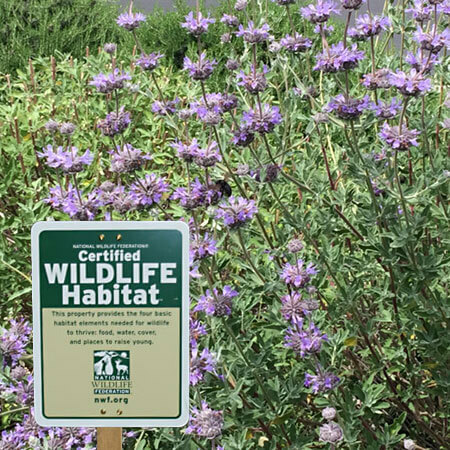 This just in: the MatternCo garden (aka, our front and back yards) is now a National Wildlife Federation Certified Wildlife Habitat®. Regardless of the registered trademark symbol, I should own up and tell you that this certification is nearly self-proclaimed (with payment of $50)… but let’s not let that take away from our celebration. Our journey to Certified Wildlife Habitat [insert registered trademark symbol here] has been a long time coming. We moved into our small corner lot in an eastern suburb of San Francisco about eight years ago. When we moved in, the front yard was all lawn. The backyard was mostly paved except for a row of ailing pine trees. Slowly but surely we removed the lawn, pavement and pines. We landscaped with mediterranean and native trees, shrubs and grasses. We put in garden beds and planted fruit trees. We avoided all toxics and even put in a small pond. All of this may lead you to conclude that our yard today is a beautiful sanctuary, and we believe it is. But it also turns out that nature can be a rather messy and unpredictable friend. Most of the time we don’t have a clue what we’re doing with our little yard. This spring the sage shrubs are nearly as tall as I am– are they supposed to be that big? A small child (or fox, should one happen to make its way to our yard given our new easy-to-read signage) could easily get lost in the rosemary. There are endless weeds to dig up, and sometimes there are critters-that-shall-not-be-named in the compost. Learning (and then re-learning over again) how to spend time and energy on things outside my work— things that don’t necessarily fall under the typical model of specialization, success and consumption— has been an important ongoing process for me, not only with regard to gardening, but in other areas of my life too. It turns out that a simple life that embraces nature and creativity and service and space (and all of the unfinished, untidy and uncertain bits in between) offers many, albeit intangible, gifts. One of which happens to be the experience of tending to a tiny patch of planet that hopefully provides some food, water and shelter for other passers by. Want to learn more? Visit the National Wildlife Federation’s Garden for the Wildlife page. These notes are so consistently charming, thoughtful and wise. They deserve a large circulation. Thank so much Tyrell, for taking a look and for your sweet comment. I appreciate it! OK, that’s it. NWF, take my money! 🙂 I hope you share more pictures of your ‘wildlife habitat’! Ha! Thanks Rosie. You and Penny are invited to come play in our habitat any time! I know you are the envy and the idol of the neighborhood! Your delightful musings make me want to take up gardening all over again, butI guess I’ll have to make do with my Tillandsias. Happy spring!